Throughout the year, the PTFA have generously funded a number of exciting art projects with parent and specialist qualified art teacher Ruth Jacob. Ruth came in to work with different year groups on a one-off piece; some individual and some put together to form a single collaborative work. This eye-catching art work can be seen brightening up the walls at both sites. The purpose of the projects what to provide the children with the chance to experience a variety of different art media, including photography, pastels, acrylic paint and batik. Children had the opportunity to learn a new skill, work with a range of media and practise seeing a project through from the initial design stage to an impressive finished piece. Year 6 completed an acrylic painting project. Working in conjunction with their geography scheme of work, the children had to choose to paint a skyline of either the River Thames or the River Nile. The project was broken down into three parts. The children studied the architecture of both skylines, identifying buildings and studying the landscape. 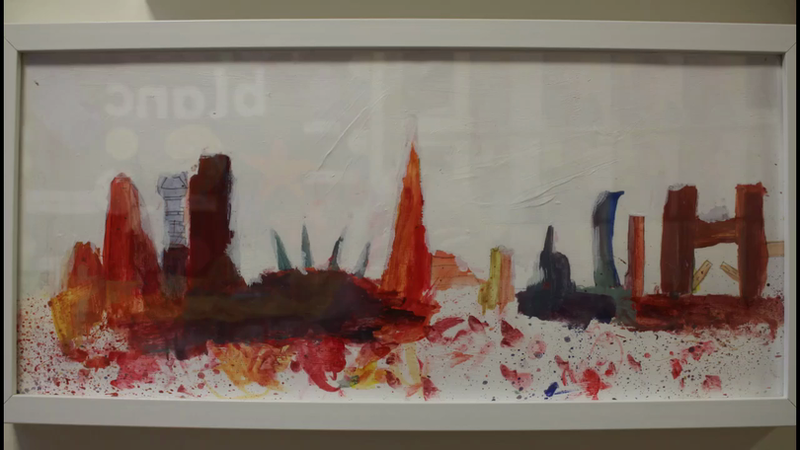 The children then had to choose between the two skylines and complete three different sketches of their chosen skyline, incorporating different buildings. Looking the colour wheel, the children revised primary, secondary and tertiary colours. They then learned about complementary colours and where they sit on the colour wheel. Following this, using primary colours only, the children completed a set of colour mixing tasks to develop their colour mixing skills prior to completing their painting. Using their final design sketches, the children used pastels to plan out the colour of their paintings. They needed to decide which sets of complementary colours were being applied onto which building and think about how they would colour mix the paints to achieve this. The children then completed their skyline paintings with amazing success. The children created their own 6”x 6” square canvas of concentric circles which were then put together to create one large canvas. Concentric circles are circles with a common centre. The children studied primary and secondary colours, and complementary colours. 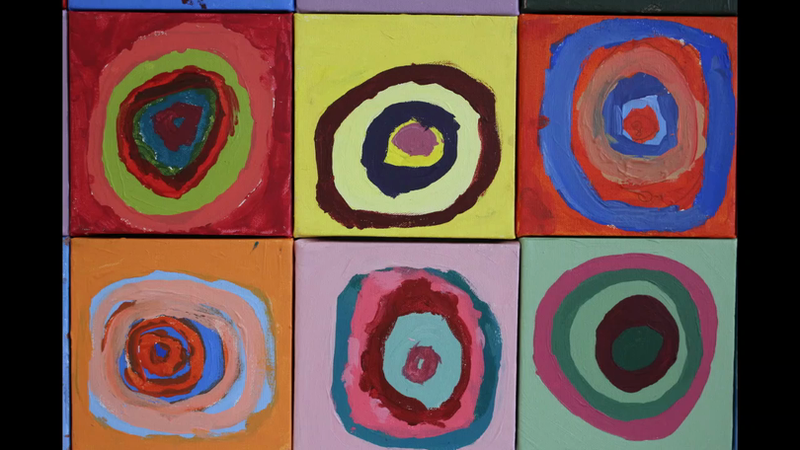 The brief was to choose two complementary colours and use their colour mixing skills to create different tones of these colours within their concentric circles. Years 1 to 6 have completed a photography project to collaborate their work with the Rights Respecting ethos at school, led by Miss Coulman. Each class chose a word to complement a different right from the UNCRC. They chose words such as peace, respect, fair, knowledge, family, prayer, support and guidance. They then cut out the letters to make their word on large card. 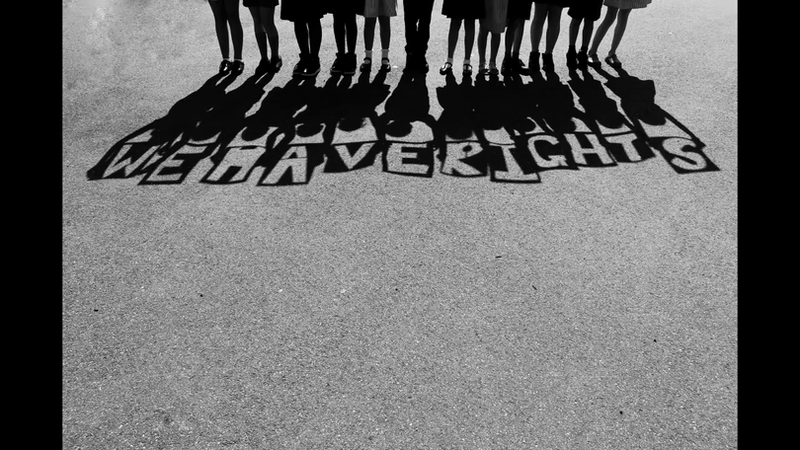 The final stage of the process brought the children together to stand holding their letters, in reverse, so that shadows reflected their word onto the playground, producing a bold and thought-provoking finished photograph. In Year 3, Ruth worked with the class to produce large collaborative batik pieces for the wall. Batik is the Indonesian art of decorating cloth using wax and dye. Each child worked on individual sketches and plans before working with a group to produce a final batik for the wall. This project was broken down into three parts. 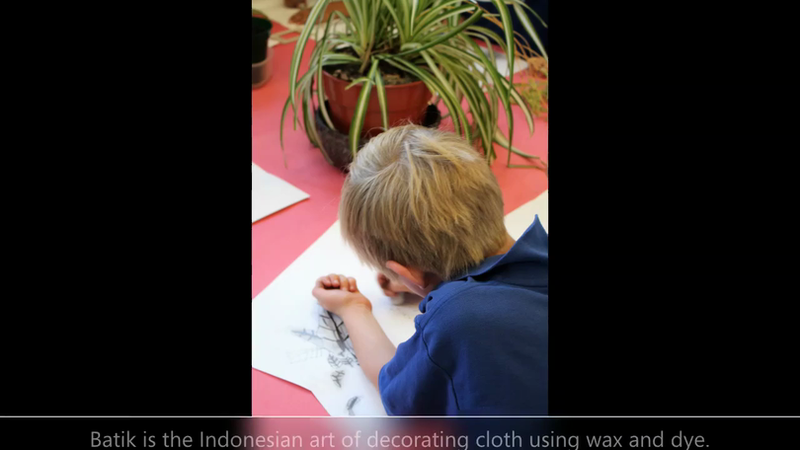 After looking at some examples of plant batik prints, the children understood they were to be completing a series of sketches with set of different plants. This was to be completed using a viewfinder to aid their concept of producing sketches of just a particular section of the plant. Looking at their three sketches, they chose a final design to reproduce on a larger scale. Following this, the children used pastels to create their bold plant sketches. When choosing the colour for the background, they looked at complementary colours to achieve the most striking overall effect. From their finished designs, five were chosen to be replicated using the batik technique, with small groups all contributing to produce a bold and high-quality finished piece of batik. Using bright fabric paints on stretched fabric, the children completed their section of a plant using careful shading and colour grading techniques before the wax was removed and the overall effect could be seen. See below some videos of these fantastic creations being produced.